We all know that the present court system in the United States of America is based upon the principle by which an alleged or suspected criminal is found guilty or innocent by a jury of his or her peers. However, it wasn't always like this about 750 years ago - that is, in the Medieval Ages - "Ordalia" was used to determine or reach a guilty or acquittal judgement on the accused wrong doer. How did such a legal system of "Ordalia" or "Trial by Ordeal' begin? Since the advent of man on this earth and his acceptance of a religion, he has believed that an All Seeing God is the most formidable, actually the best, witness for the innocent and a strong defender of righteous people. The evil doer commits his crime at a time and place - at least so he thinks - when and where no one sees the actual criminal action. Therefore, in the early centuries of civilization, especially in the Middle Ages, it became vitally necessary to call "the most righteous judge above the clouds" as a witness to the alleged crime or trespass. This necessity brought about the "Ordalia", the "Trial by Ordeal" system not only in the many countries of the Medieval World, but also in the land of our Rusyn (Carpatho-Rusyn) ancestors. This writer faintly recalls the coal miners, after they were through playing the sociable game of "Durak" or "Dunce", in the 1920's, talk about the Rusyn ancestors travelling to "Velikij Varaden" in the Hungarian plains to participate in a "Bozij Sud", the Carpatho-Rusyn term for "Trial by Ordeal". Perhaps someone may ask - "Why did they travel to Velikij Varaden?" To obtain the answer, it is necessary to note that about 750 or so years ago - the so called "Russka Kraina" or "The Russian Territory" covered a large expanse of land from the north down to the Marie Poch region and "Velikij Varadin". The Prince or Commander of this Russian territory was Emerick, the son of the Hungarian king, St. Stephen. The large expanse of "Russka Kraina" was narrowed because the Hun and Tartar invasions forced the Rusyns to leave the plains of Hungary and retreat to the confines of the Carpathian Mountains. While the Rusyns escaped from the invading hordes, they did not escape from the criminal acts which they themselves committed. The suspected or alleged evil doers were brought to trial. Many times the local judge or chieftain was unable to determine who was innocent or guilty of the alleged criminal offense. Consequently, he sent the disputants or suspects to Velikij Varadin where the "Ordalia" determined who was guilty and who was not. There were two type of "Ordalia:; the one-side (accused or defendant only) and the two-sided (the accusee and the accused). In the one-sided type the accused was forced to undergo the ordeal to determine if he was innocent. In the type where two individuals were involved, the accuser and the accused had to each participate in the trial by ordeal to determine who was guilty. Sometimes the antagonists in a two-sided case settled their differences by fighting a duel; instead of going through the ordeal. The fallen or slain disputant was always judged as being guilty. The innocence and guilt of the accuser and accused was also determined centuries ago by using a large cross. Both had to stand with outstretch and uplifted arms before a cross. The individual whose arms dropped first was declared to be guilty as charged. There must have been many innocent individuals who were found guilty by this crude and primitive legal method. The cross was also used in one-individual ordeal trials. The alleged or suspected criminal was blindfolded and was led to a large cross under which there were two canes, one of which had a symbol of the cross whittled on it. If the accused individual chose the cane with the cross symbol, he was declared innocent. It is evident that the alleged criminal had a 50-50 chance of "beating the rap". For one thousand years some Rusyn people lived within the jurisdiction of the Kingdom of Hungary where the "Ordalia" was practiced, as already mentioned in this article. During the reign of St. Ladislaus, the Trials by Ordeal were often held in Hungary, with fire and water becoming important factors in the determination of guilt or innocence of the accused. There were two ways of using a very hot fire for this purpose. In one instance, the suspect had to carry a very hot iron plate or a burning coal in his hands for a short distance. In the other case, he was forced to walk a few steps barefooted on a hot iron plate. The judge immediately wrapped the burned hand or foot with wax covered rags. He then wrapped a new bandage of clean rags in such a way that no one could do any tampering or give some healing help. Three days later, the bandages were taken off the hand or foot, and if the wounds appeared to be healing, the accused was declared to be innocent. If the wounds were not healing, but festering and having an odor of decay, the suspect was judged guilty. Innocence or guilt of the accused was also determined in these trials through the use of boiling or cold water. A ring was tossed into a large pot of boiling water and the accused was ordered to get it out with his arm. If the arm was not scalded, he was considered to be innocent. A scalded arm meant that the accused was guilty. Here is how cold water was used for determination: The arms and legs of the accused individual were tightly bound and he was dropped into the deepest part of a cold river or lake. This cold water ordeal was only used in the late autumn and winter months. If the tightly bound individual started to sink, he was pulled out of the water and revived because he was judged to be innocent. If the accused did not sink and remained afloat - the judge declared him guilty. A determination of innocence or guilt was also made by using a piece of holy bread or wafer host, which had to be eaten by the suspected criminal. If he suffered no pain and did not feel sick, he was declared innocent. This determination was based on the assumption that if an evil doer would eat something holy, he would die almost immediately. The ordeal trials were, to a large degree, without any solid basis for the determination of guilt or innocence. However, in most cases they proved successful because the gnawing conscience of the evil doer would cause him to confess his crime instead of going through the trial by ordeal. It is hard to believe, but it is true. Centuries ago, in the lands of our Rusyn ancestors, witches were tortured and burned at the stake. However, there was no Carpatho-Rusyn Nathaniel Hawthorne to write about these ghastly episodes. At that time, most Rusyns believed that there were women who practice witchcraft, sorcery, hypnotism and bewitchery, and thus were able, because of their alleged alliance with the devil, to bring sickness and misfortune upon people and animals. Before the torch was applied to the witches, a lengthy examination based upon torturous ordeals was conducted to determine their guilt. 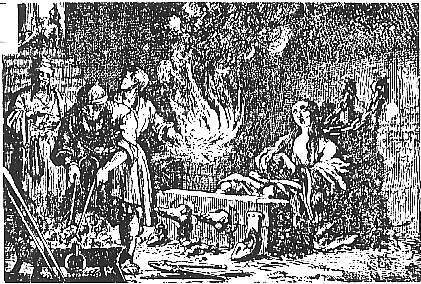 A pictorial illustration of a witch trial is shown above. The cross examiners used many bestial forms or torture to force admissions of guilt. The witches, sorcerers and enchantresses in that period were doomed to death whether they admitted or did not admit guilt. In conclusion, we all should be grateful to God that the court system of centuries ago, as described in this article, has been replaced by the present legal system.